Ventricular septal defect (VSD) is the most common congenital heart disease affecting 2.62/1000 live births worldwide. Long-term survival of these patients largely depends on the size of the defect, magnitude of the shunt, presence and severity of pulmonary hypertension, and subsequent management. While most small VSDs are managed medically, moderate to large sized VSDs require some form of cardiac intervention. Over the past 10 years, there has been a shift from surgical closure to percutaneous catheter-based closure of VSDs in select group of patients with small to moderate sized defects. Transcatheter closure of VSD is preferred because of the relative safety, lower morbidity, absence of cardiopulmonary bypass, no scar, early recovery, and ease of procedure. Device closure techniques have shown 96%–97.9% success rates without residual shunts., Serious adverse events arising out of catheter closure over long-term are about 8.6%, most being due to various degrees of heart block. The rate of tricuspid stenosis or regurgitation is only 0.7% with most being managed conservatively. Tricuspid valve (TV) injury causing severe tricuspid insufficiency requiring surgical repair is very rare, in most cases is seen acutely due to involvement of the subvalvular apparatus. 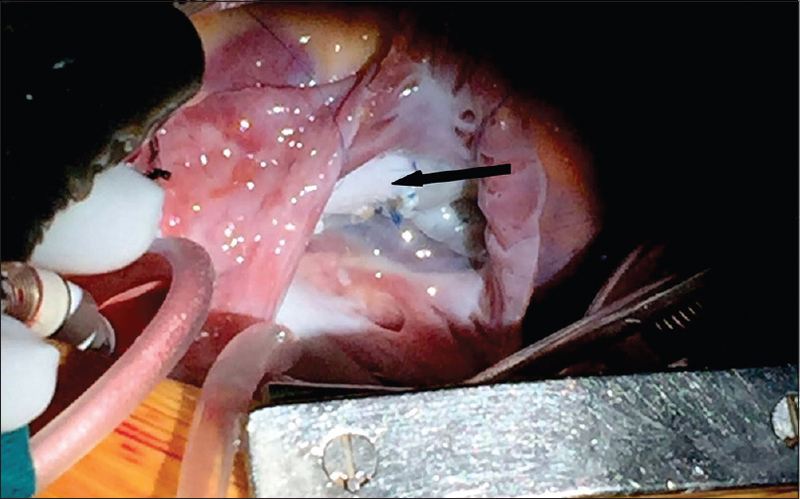 Here, we report two cases of TV leaflet tear following perimembranous VSD (PMVSD) closure using Amplatzer duct occluder I (ADO I), occurring 6 weeks to 3 months after device closure and resulting in severe tricuspid regurgitation (TR) requiring surgical intervention. A 5-year-old boy presented with repeated respiratory tract infections and failure to thrive. Clinical examination revealed normal vitals, no evidence of heart failure with a normal heart size and left ventricular (LV) apical impulse. There was a grade 3/6 pansystolic murmur in the left parasternal region. His chest X-ray showed a cardiothoracic ratio of 55% with mild increase in the pulmonary vascularity. The electrocardiogram was normal without any baseline conduction abnormality. A two-dimensional (2D) echo and color Doppler study showed a small 4.5–5 mm PMVSD with a left to right shunt. The VSD was restricted by 112 mmHg. There was a TV aneurysm restricting the VSD with a trivial TR. The aortic valve was normal. His LV was mildly volume overloaded with normal contractility. He underwent transcatheter closure of the PMVSD at another center using 8 × 6 ADO I. The procedure was reported to be uneventful and he was discharged 24 h later with the device in position without any residual shunt and with a mild TR. Six weeks later, he presented with shortness of breath and easy fatigability. His 2D echo color Doppler revealed flail TV leaflets with severe TR [Figure 1]a, [Figure 1]b and [Video 1]a, [Video 1]b. He was advised surgical removal of the device with repair of the TV which he underwent successfully, making an uneventful recovery. 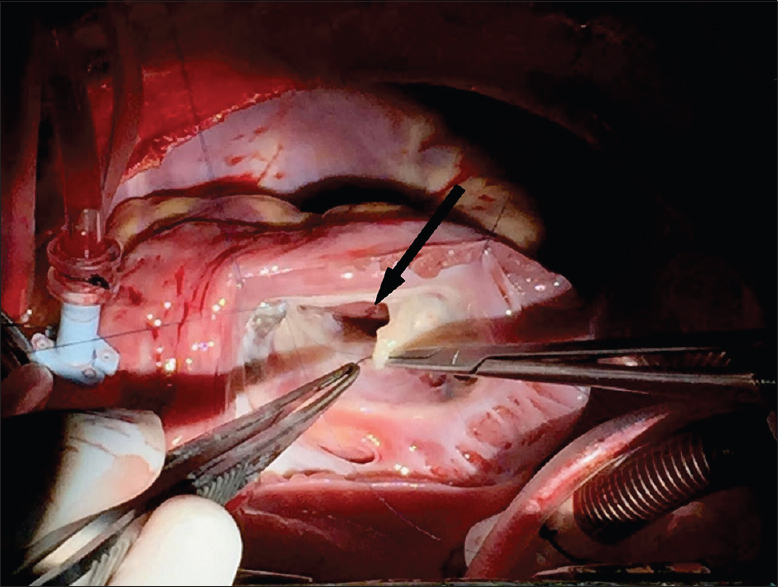 At surgery, his septal and anterior leaflets were found to have large tears which were repaired by augmenting the leaflets with a pericardial patch. There was no injury to the subvalvular apparatus. A repeat 2D echo color Doppler evaluation showed no residual VSD and just a mild residual TR [Figure 2]a, [Figure 2]b and [Video 2]a, [Video 2]b. A 10-year-old boy presented with mild shortness of breath that aggravated on physical exertion. Cardiovascular examination revealed a normal size heart with an evidence of small to moderate sized VSD with a left to right shunt. There was a short flow murmur across the mitral valve suggestive of significant left to right shunt. His 2D echo color Doppler showed a PMVSD measuring 7–8 mm on the LV aspect with two jets emerging on the right ventricular (RV) side; the larger jet measuring 6 mm. He had a TV aneurysm tending to cover the VSD with a resultant mild TR. In view of his symptoms and significant left to right shunt, he underwent device closure of PMVSD using 10 × 8 ADO I. The procedure was uneventful and he was discharged the morning after the procedure with a tiny residual shunt through the additional fenestration and with a mild TR. Six weeks later, during the follow-up visit, his TR had progressed to little more than mild grade. However, at 6-month follow-up, the TR became moderately severe although he continued to remain asymptomatic. His RV showed mild volume overload with normal contractility. He was then advised surgical intervention; however, the family deferred the same for almost a year at which time the TR became severe [Figure 3]a, [Figure 3]b and [Video 3]a, [Video 3]b with right atrial and RV enlargement. At the time of surgery, the right atrium was opened in the usual manner under cardioplegic arrest. Part of the anterior leaflet and the septal leaflet was found torn and part of the leaflet was flail [Figure 4]. In addition, half of the septal leaflet was stuck to the VSD device. These two components of immobility of the septal leaflet and torn anterior leaflet were responsible for the TR. The tricuspid annulus was not dilated. During repair, the adherent leaflet was mobilized and flail removed by a triangular-shaped incision with the apex pointed toward the orifice and base at the annulus. A triangular pericardial patch treated with glutaraldehyde was stitched in the gap with continuous sutures [Figure 5]. Valve function was checked with cold saline injection and was found to be good with minimal TR and no tricuspid stenosis. The TV chordae and papillary muscles were intact. His postoperative recovery was uneventful. His 2D echo color Doppler examination at 3-month follow-up revealed the device to be in the position with a tiny residual shunt. There was a mild residual TR [Figure 6]a, [Figure 6]b and [Video 4]a, [Video 4]b. His right atrium and RV showed remarkable reduction in their size. Catheter closure of perimembranous VSD is performed using various devices with a high success rate. The most frequent and significant complication of this procedure is complete A-V block which is reported in up to 5% of cases, especially with the use of Amplatzer asymmetric PMVSD occluder., Additional complications of the persistent residual shunt and aortic and tricuspid insufficiency have also been reported. Most of the reported cases of tricuspid insufficiency show nonprogression or spontaneous resolution over a period of 3–5 months, none requiring surgery in the immediate or midterm follow-up period., Significant tricuspid insufficiency reported so far has been due to the entanglement of the occluder with the chordae tendineae and is visible immediately after the procedure., In contrast, both our cases did not develop TR immediately after the procedure. It was noted that at 6-week follow-up in the first case and in the second case, it increased gradually over 3 months to a year after the procedure indicating its subacute to chronic nature. This shows that the injury to the TV can be gradual and progressive. In both cases, the TV leaflets revealed a tear without any injury to the chordae or the papillary muscles. The probable mechanism of such a tear is the trauma caused by the rigid body of the ADO I to the septal and anterior TV leaflets. Unlike in the previously reported cases, the TR was found to be severe requiring surgical intervention in our both cases. Fortunately, both our patients had a successful TV repair with a mild residual leak. To the best of our knowledge, such an injury has never been reported in the literature so far. Importantly, in both cases, we could not identify any feature before or during the procedure either on transthoracic or transesophageal imaging or otherwise which could predict the occurrence of this complication. TV leaflet tear without any injury to chordae tendineae resulting in the development of severe TR is an extremely rare, previously unreported complication of PMVSD catheter closure using ADO I. Our cases emphasize the fact that the concern about TV injury with a single disc device is as much as with double disc devices. In addition, they reveal that the injury to TV may not always be acute and can occur over a period after the procedure and can be progressive in terms of its severity. van der Linde D, Konings EE, Slager MA, Witsenburg M, Helbing WA, Takkenberg JJ, et al. Birth prevalence of congenital heart disease worldwide: A systematic review and meta-analysis. J Am Coll Cardiol 2011;58:2241-7. Minette MS, Sahn DJ. Congenital heart disease for the adult cardiologist: Ventricular septal defects. Circulation 2006;114:2190-7. Fu YC, Bass J, Amin Z, Radtke W, Cheatham JP, Hellenbrand WE, et al. Transcatheter closure of perimembranous ventricular septal defects using the new Amplatzer membranous VSD occluder: Results of the U.S. Phase I trial. J Am Coll Cardiol 2006;47:319-25. Mertens L, Meyns B, Gewillig M. Device fracture and severe tricuspid regurgitation after percutaneous closure of perimembranous ventricular septal defect: A case report. Catheter Cardiovasc Interv 2007;70:749-53. Liu J, Wang Z, Gao L, Tan HL, Zheng Q, Zhang ML. A large institutional study on outcomes and complications after transcatheter closure of a perimembranous-type ventricular septal defect in 890 cases. Acta Cardiol Sin 2013;29:271-6. Holzer R, de Giovanni J, Walsh KP, Tometzki A, Goh T, Hakim F, et al. Transcatheter closure of perimembranous ventricular septal defects using the Amplatzer membranous VSD occluder: Immediate and midterm results of an international registry. Catheter Cardiovasc Interv 2006;68:620-8.